The 2017 Buick Enclave remains one of the best buys in the large, three-row crossover SUV segment, and critics are in overwhelming agreement. Edmunds says it “can shuttle lots of people and cargo,” while Kelley Blue Book says it “has a solid price advantage over many of its luxury rivals.” Topping it off, The Car Connection says “it’s comfortable and classy.” Take a closer look at the 2017 Buick Enclave reviews, and then see it in person at Westridge Buick GMC! The interior of the 2017 Buick Enclave gives you lots of room to work with; its spacious cabin offers a total interior volume of 151.2 cubic feet. The standard setup comes with second-row captain’s chairs and a passenger volume of seven, while certain trims also give you the option of a second-row bench seat that increases the passenger capacity to eight. Behind the rear seat, you’ll have 23.3 cubic feet of cargo space, and opting to use the second and third rows for cargo opens up a max cargo volume of 115.2 cubic feet. 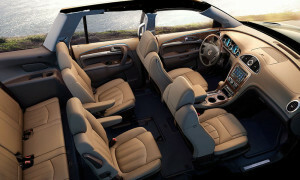 There’s no questioning the status of the Buick Enclave as a premium crossover SUV. The exterior features a distinguished front grille, xenon headlamps, 19-inch alloy wheels, and rear privacy glass. You can also choose package options that add bronze or satin black finishes. Inside the cabin, the Enclave is available with premium luxury features like leather upholstery, heated seats and steering wheel, a 10-speaker Bose® surround-sound stereo, a rear-seat entertainment system, and much more. From its comfort and style to its outstanding value, auto reviewers have made it clear why the 2017 Buick Enclave is such a smart choice in a crossover SUV. See if it’s the right pick for you and your family at Westridge Buick GMC, located at 2406 50th Ave in Lloydminster. If you have any questions, don’t hesitate to contact our knowledgeable sales team at 855-829-1813.